Cat 8: Fighter The tasty habits continue with this air superiority fighter, guaranteed to win your taste buds and your country! Conflict continues to spark across the world, There is terror; there is famine, fleeing, and death. Refugees are pouring in to friendly countries following an attack on the once allied states of North America. In the midst of this, a small industry struggles to survive. After their headquarters took a bomb launched by evil overlord Bacca, Paramaribo Unorthodox Productions has officially moved operations to the capital city of Suriname. Peace is no longer a dream even to the most optimistic, and war is the one definition of the foreseeable future. Recent news reports have highlighted this small firm, tracking its movements and publicizing it to the local news networks. Their first production, the GCSaRSC-D, has already shown what a random, strange, or even plain outrageous idea can do when put in the right hands. * The NTSB’s report on the event stated that an experimental military-refitted rotor aircraft took to the air Saturday June 20 from a former Oregon territory, and was not heard from until Wednesday, four days later. According to the report, the vehicle had crashed on an island small enough to be excluded from the world map known as Hawaii. Those on board had fed off of the vehicle itself, made of a granulated sugar compound, until they acquired assistance from friendly natives. In exchange for their aircraft, estimated at $50,000 of confectionary consumables, the two crewmen received a flight back to mainland NA. Since then, over a span of two days PUP and their ally, VADesigns, have completed their next vehicle to enter the testing stage: CCA3I (Candy-Coated Air Superiority Atmospheric Attack Interceptor). This new hybrid of consumable and technical applications is the ultimate vehicle to take the skies. Colored bright yellow, so that no enemy could possibly miss its approach, the craft is specifically designed to strike fear into his opponent. Normally, the character it features is considered to be a harmless, possibly even adorable mascot for one of the world’s leading candy varieties. But now that money is scarce and more significant foods are in high demand, PUP has bought virtually all of the candy stock to be found in SA. This model was designed with aerodynamic restraints in mind, crafted out of the toughest edible material known to man. Recent legend has it that the recipe for the outer hull includes bits of diamond harvested from tequila, therefore edible but solid enough to make the vessel endure the strains of pulling up to 9.5Gs. Its actual strength has yet to be proven, but by joining its brethren aircraft in The Tootsie Confederacy’s fleet, it will have its own sweet taste of victory. Two tons of delicious terror falls from the sky! Mars is invading! It can land. In a box! A full pilot can reside in the cabin. Don't worry, there's air conditioning. The character side again, prepared to enter into delicious mortal combat. DAS, the flag emblem is the "m" on the M&M's chest. Historically, the "m" stood for the maker of the M&M, Mars, as well as his compatriot, Murrie, then the son of Mars' toughest competitor, Hershey. 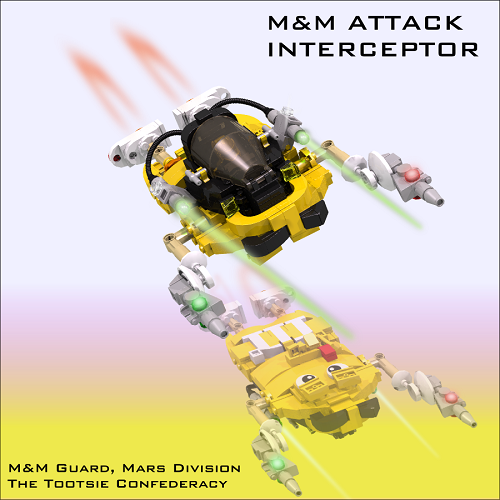 Therefore, I believe the "m" is a legitimate flag representing the Mars Division of TTC's military. This is my entry to the Fighter category of Decisive Action 2. Please leave a comment or show your appreciation by liking this model. 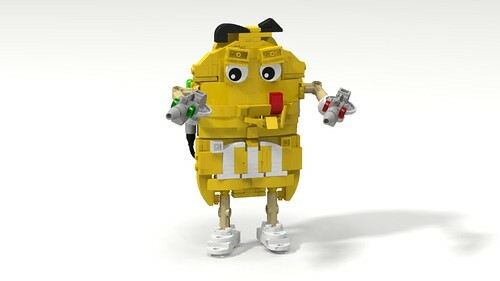 I hope a battle-hardened M&M can make your day like it made mine. Thank you for looking! DAS, when you open the LDD file it will say there were two pieces removed. These are the eyebrow connectors and sitting to the left of the model upon entry. They can be replaced manually with little effort. Quoting Sam the First Really fun build, but also some serious techniques going on. Loving the m! Fantastic work, good luck in the contest! Haha, I just saw this comment. Thanks you, Sam! Really fun build, but also some serious techniques going on. Loving the m! Fantastic work, good luck in the contest! Quoting Ian ... Very cool! That M&M Guy looks so realistic. Good luck in the coming combat! Thank you, Ian! Good luck your way as well. Quoting Sam Sanister But does it melt in your mouth, not in your hand? Actually, it's designed not to melt anywhere. The shell is a crystal-like material that needs to be ground before eaten. So, theoretically it wouldn't melt in a hand or mouth. I think we're about to find out if it will melt under heavy fire, though! Thank you, Sam! Quoting Tirrell Brown Thd skies in the Western Hemisphere is filling up with deadly craft! Chalk full of 'em! Next on the ORBAT is an airship. Thank you, Tirrell! Thd skies in the Western Hemisphere is filling up with deadly craft! But does it melt in your mouth, not in your hand? Very cool! That M&M Guy looks so realistic. Good luck in the coming combat! Quoting Sean B Haha, great design. I love the mirrored image. Thank you, Sean! I'm glad the head image turned out so well. Haha, great design. I love the mirrored image. Quoting Nick Barrett Chocolate dipped in Tequila ? Mmmmm.... tasty! Great build, something different. Good luck. You called my bluff. Darned news reporters! Please don't tell Papa Tequila; I don't think we have enough chocolate to go around. Thank you again for commenting, Nick! Quoting Stuart Lucas Haha, I like the mirror image shot at the start! Great write-up too, well done! Thanks again, Stuart! Your comments keep me inspired! Quoting Ron L. Mitchell DA approval for this fighter is hereby granted; you are specs accurate for the category. Good luck in the emerging conflict. Note: When checking a LDD file, I look at the model as presented, I look for why bricks might have been removed due to wrong placement (according to the program) and then I look at the building instructions running through how it goes together. You have some interesting techniques and parts choices for your builds. I am not always sure how sturdy some of them may be in real world brick but swooshability is not a factor in DAS approval. Again, good luck; fun whimsy. Yes! Thank you, Ron. It's neat you give the job that much attention. I've been coached by some of the best, especially David Roberts, on the importance of including realism even in a virtual setting. I'll admit it's still tempting to cut corners, and I know there's at least one such questionable connection in my build. I figured though that I could build it in real life and actually photograph it; therefore I considered my job sufficient. Thank again, DAS. 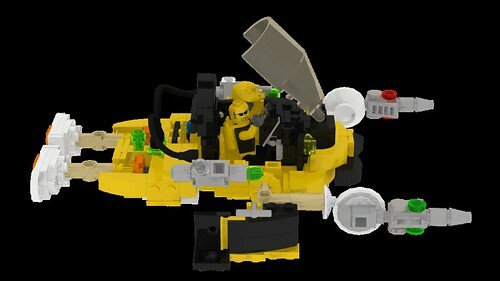 Quoting Oran Cruzen This is a great work of Lego "Sweet" creationism! You can almost not look at candy the same after this. To bad some of what you said in your description is more truth than fantasy. Thank you, Oran. I think it's about time for a global candy redemption movement, don't you? I mean, who doesn't agree edible vehicles could be the future! I'm glad you stopped by! Quoting Pico van Grootveld M&Ms roaming the skies, what's next I wonder :D Careful not to fly in warm areas though, it might melt hihi. Jokes aside, great take on the subject and fitting to your theme. Well done! Isn't that what I stole-*ahem*- borrowed a shipment of your tequila gems for?! Keep wondering, Pico! I'm starting to surprise even myself; this one in particular went form early inspiration to production in two days. Who knows what's next! Thank you, Kira! It's great to hear from you! Quoting David Roberts What a great concept and a super way to include a logo. I wonder if M&M would use one for promotions/advertising? I was a bit confused by the title photo as the navigation lights on one of the two aeroplanes are switched around. A truly original take on this category! Haha, I thought about that M&M advertising bit too! To answer your question, the head image is showing a sort-of reflection. Those are actually two separate renders 'shopped together. It's representing a single vehicle, per recent guidelines. I'm glad you like it! Quoting Stephan Niehoff A great idea in my opinion. Quoting The Northern Imperial AKA - Lord Bacca. Thanks for the plug!, I have a sweet tooth too! Nice build. Hey, you're welcome. I figured you deserve it. Thanks for the comment! Chocolate dipped in Tequila ? Mmmmm.... tasty! Great build, something different. Good luck. Haha, I like the mirror image shot at the start! Great write-up too, well done! DA approval for this fighter is hereby granted; you are specs accurate for the category. Good luck in the emerging conflict. Note: When checking a LDD file, I look at the model as presented, I look for why bricks might have been removed due to wrong placement (according to the program) and then I look at the building instructions running through how it goes together. 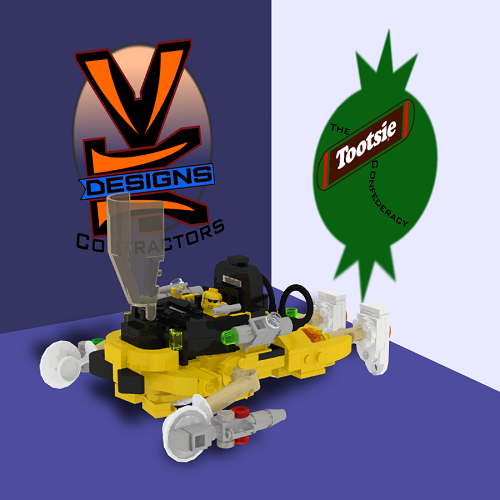 You have some interesting techniques and parts choices for your builds. I am not always sure how sturdy some of them may be in real world brick but swooshability is not a factor in DAS approval. Again, good luck; fun whimsy. This is a great work of Lego "Sweet" creationism! You can almost not look at candy the same after this. To bad some of what you said in your description is more truth than fantasy. M&Ms roaming the skies, what's next I wonder :D Careful not to fly in warm areas though, it might melt hihi. Jokes aside, great take on the subject and fitting to your theme. Well done! What a great concept and a super way to include a logo. I wonder if M&M would use one for promotions/advertising? I was a bit confused by the title photo as the navigation lights on one of the two aeroplanes are switched around. A truly original take on this category! A great idea in my opinion. Thanks for the plug!, I have a sweet tooth too! Nice build.